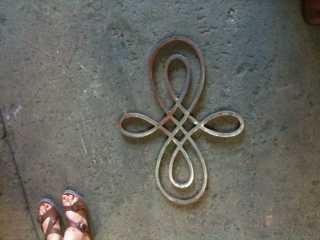 This afternoon I visited Alberto Jauregui’s Iron Works with my client with orange painted toenails. She is shopping for an elegant steel railing. Daphne and I got to know Tom Bredlow who was reputed to be the best iron worker in th last century or so. What he could do with hot iron was almost unbelievable. In Tucson one can see some of his work here and there. He also did the gates for the national cathedral in Washingon. Is he still working? Ill look him up.